Is it Chili in here or is it just me? Imagine that there’s an early hominid wandering through a forest. It’s a nice day. He’s been hunting, but hasn’t found anything for dinner just yet. He looks and sees a small plant with a number of dangling red fruit-y things. They’re not as long as his finger, and the’re about that big around. He’s seen things like it before, but never this exact thing. Other fruit-y things He’d eaten have tasted really good, kinda sweet, sometimes with a bit of tang. So, he pulls a few off. They feel lighter than most fruits, as if they were hollow. Still, he lifts one up to his mouth and takes a bite. Immediately his mouth floods with pain, as if it were on fire. His eyes tear and his face feels flush and hot. All he can think of is getting something to cool down the burning on his tongue. He sees a stream nearby and rush to it, cupping the precious cool water in his hands. Each drink cools the heat and calms the pain, but only for a moment, so he drinks more and more. Finally, he stops, because it just isn’t helping. But it’s not long before the pain begins to subside, and he shakes his head and walks away, a valuable lesson learned. Today, of course, we know of the evolutionary value of a defense mechanism like this. If everyone that tries to eat you ends up screaming in pain, you don’t get eaten very often. Your species lives and reproduces. But that only works if the predators are smart. And, we’re dealing with humans, here, or the ancestors of them. Humans are not known for taking lessons well. See, because somewhere along the evolutionary line, one of our great-great-great-great-etc grandparents actually went BACK to that burning bush and ate those peppers A SECOND TIME. Maybe he just gave them to a friend so he could laugh as the victim of his prank danced and guzzled like he had done the first time. But, no matter, at some point someone decided that this burning blaze on his tongue, this firey feeling was a good thing. And that’s why, today, we have hot sauce. The other day, I saw this video that explains why 1) peppers burn our mouths, and 2) why it feels so good afterward. It’s a fascinating video and article, and in summary it says that the capsaicin molecules in the peppers (which actually cause the heat) react with the nerve receptors on our tongues and fool them into reacting as if they’d actually touched something physically scalding hot. Our minds actually think that our tongue is scalding. The reason water doesn’t help is that the capsaicin is an oil, so the water doesn’t wash it off. It only temporarily tells the tongue nerve receptors that they’re cool. Then, when the water’s gone and swallowed, the heat comes back because the capsaicin is still there. That heat and pain also automatically trigger our body's responce, which is: pain relief! Endorphins! That's why after, you feel flush and excited. In fact a few pain creams and ointments utilize capsaicin to trigger the body's natural pain relievers, topically. It’s interesting to note that, according to the article, the menthol in mint and mint candies work the opposite way, fooling your tongue into thinking it’s touching something cool. 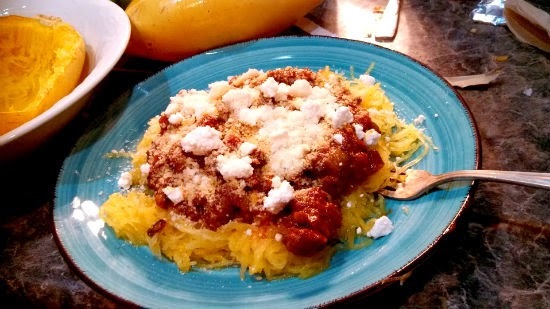 My mom made Spaghetti squash a lot when I was a kid, so I’m pretty familiar with it. For those that aren’t, it’s a yellow winter squash, and after it’s cooked, the flesh is scraped off the rind. When you do it, the flesh shreds into short strings and looks a lot like spaghetti. It has a slightly sweet taste with a crunchy texture. My mom always served it up with some kind of marinara/meat sauce, and I liked it a lot. I can remember one time, I had this “Ah-ha!” moment, and I blurted out to my mom, “They must have crossed a squash with spaghetti!”. And as soon as I said it, I realized how dumb that was. Lately we’ve been trying to eat healthier, so we got a few squashes. I did some research and found that there are a lot of ways that people use them. Of course, there’s the traditional “italian” tomato sauces, as a main dish, but there are also those that use it as a side, and just apply butter, garlic and herbs. Another cool thing is that it will keep on your counter top for weeks. In this dish, I wasn’t really going for “healthy” because I used ordinary pork sausage, but even still, I figured that a full plate was only about 700-750 calories, including the parmesan and feta. That’s not bad for a main evening meal. If you wanted to go even less, you could use ground turkey, and even spice it like a sausage. Another comment: It was tricky to figure out how many spaghetti squashes to cook for how many people. For some reason, the websites I looked at didn’t say, either. I found that as a main dish, one squash will do a full plate for two people. As a side, one spaghetti squash could probably serve three to four. I started out by lighting up a lot of coals, because I’d be cooking both the squashes and the sauce side-by-side. I cut the squash in two, lengthwise, using a butcher knife. It was tough, so I went with the big blade! I scooped out the seeds and the stringy guts and left the regular squash flesh in place. I drizzled on some olive oil and some salt in each half, and put them into the oven, upside down. I cut open the second one and did the same. Actually, I had some of the pieces the other way, like a bowl, and the moisture got trapped as it cooked, and made for runnier “noodles”. The squash had to cook for a long time. In retrospect, I would consider pre-heating the Dutch oven, while getting everything ready. That would have cut down on the time a bit. Once the squashes were in place, it was just a matter of maintaining the heat, for about an hour and a half. In the meantime, I made the sauce. It’s a pretty straightforward spaghetti meat sauce, and if you wanted to, you could even use bottled sauce. But I made my own. I started off with coals under my 12” Dutch oven, heating up a bit of olive oil. I sliced the mushrooms and started sauteing them. My wife likes her mushrooms cooked down quite a bit, browned and done. Over the years, I’ve come to love them this way, too. It takes a little longer, though. Once they’re close to done, I added in the onions and the peppers, and, finally, the garlic. A bit of salt as each one is added helps to extract the moisture. Once the veggies had gotten a little brown, I cleared them off to the sides and put the meat in the center. I browned it fully, and added the tomatoes (with liquid), and the sauce. Finally, I added the seasonings to taste, and replenished the coals for a good simmer, with the lid on. When I could stick a little wooden skewer into the flesh of the squashes without much resistance, I knew they were done, and the sauce was well-simmered as well. I brought it all in. I let the squashes cool, with the lid off, for a little bit so they would be easier to handle. I pulled each one out, one at a time, and, with a fork, began scraping the insides of the squash “bowl”, lengthwise. Immediately it pulls apart into short threads, like pasta. I lifted it out as I went onto the plate, When the squash was empty, the plate was full, and I spread it out. I ladled on some of the sauce, and finally, sprinkled on the cheeses. You eat it with a fork, but not like spaghetti, where you twirl it around. The “noodles” aren’t long enough for that. You just scoop up a forkful and enjoy it! This was the first time my son remembered trying it, and he loved it!